Sure to wow your friends, this high-low prom dress is as unique as can be. Break out of the mold in this fabulous party dress featuring an a-line skirt that flows away from the hips to a short length in front and cascades down on the sides before ending in a chic longer length in back. A satin sweetheart lining can be seen through the high-neck embroidered-mesh overlay for a look that is truly beautiful. A vintage-style gleaming satin bow defines the natural waistline on the high-low prom dress. 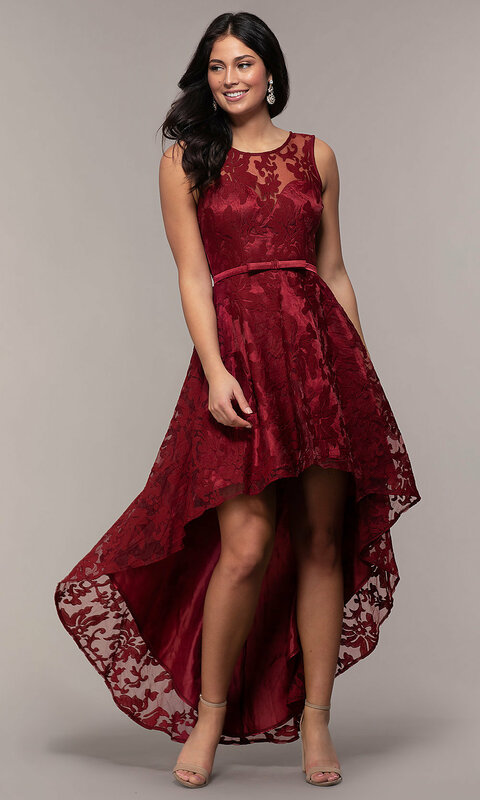 Under $150, this charming lace dress is sure to make a fashion statement at prom 2019, a wedding reception, or another semi-formal event. The model wearing navy is 5'9.5" and wearing 3.5" heels.